The next IGDA Phoenix meeting is coming up quick! Join us on July 30th, 7:00pm, at the University of Advancing Technology. What can be learned from attempting to create deeply complex toys without a scope, plan, or timeline? Join Tyler Coleman for a discussion on digital toys, accessibility, complexity, maximalism, and the mystical goal of Sublime. For those of a more practical sensibility, there will also be tips and tricks on how to mitigate failure and risk through rapid prototyping and experimentation. Tyler Coleman is the Owner and Creative Director of Retora Game Studios. Retora is an independent studio that focuses on developing deep games for niche audiences. 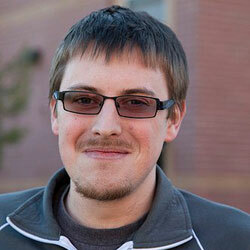 Tyler has functioned as designer, programmer, producer, and business manager. He has worked on over a dozen titles, with 4 mobile releases in the past year. He has spoken at multiple events, including IGDA Phoenix, TEDxASU, and the IGDA Summit. His passions include Procedural Generation, Rapid Prototyping, Lua, Algorithmic Art, and Philosophy.